When it comes to caring about crew, Vanguard is unmatched. With amazing health benefits, on-campus gyms, and even pet insurance, it’s hard to dispute that Vanguard is one the best companies to work for. One of the benefits I want to focus on today is Vanguard’s annual Volunteer Time Off, or VTO day. Every year, crew members get to take a paid day off from work to volunteer, sometimes with their team or on their own with their favorite charity. Many teams organize group activities at non-profits like Cradles to Crayons, while some crew go off on their own to volunteer at a local charity that needs help. Here at Vanguard our work revolves around the three Cs: Clients, Crew and Community. Our clients differ based on the different divisions at Vanguard, but as crew we are always dedicated to serving these clients in the best way possible. The Retail Investor Group (RIG) is our largest division, serving approximately 7 billion clients and small businesses with over $1 trillion in assets under management (AUM). These clients are individuals who trust Vanguard with their savings because of our low-costs but also the way we treat them in every day interactions. Karin Risi, the Managing Director of RIG, has been at Vanguard for 20 years. She reports directly to Vanguard’s CEO and has a large team with six different subdivisions in RIG. Each of these business areas work together in creating an engaging and positive environment for our clients. Last but not least, Vanguard strives to make communities stronger in many different ways through a variety of activities. 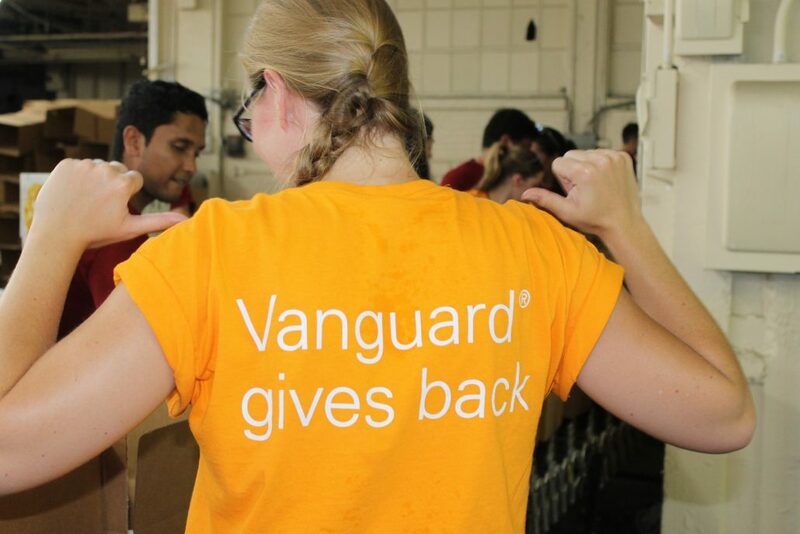 One unique experience I was able to have through the internship program was being placed on a team within Vanguard Charitable where we specifically analyzed ways to positively influence high impact philanthropy. The goal is to better assist donors in making long term contributions to 501c3 organizations of their choice, whose missions align with the type of impact they hope to make with their charitable donations. Supporting Vanguard Charitable clients and making an impact in the community at the same time was a great experience. The idea of serving others before self has been ingrained in our culture and is why our third “C”, community, is so important to everyone here at Vanguard.